I have been writing computer programs professionally for over 20 years. I hold professional certifications from Oracle (Sun), Microsoft and the Linux Professional Institute. Robotics is my spare-time hobby, and I have developed many autonomous robots including OAP and Lord Nelson. 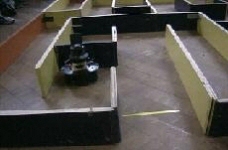 I keep an online diary of my robotics-related activities at robots.net. Copyright © 2004 - 2012 Dafydd Walters.